Read this chapter from McKenzie Wark’s Gamer theory about Katamari Damacy and post a response in the comment section. It can be a straightforward response to the text or a similar reflection on a game you care about, a game that made you think and gave you new theoretical tools to understand the world. Gamer Theory uncovers the significance of games in the gap between the near-perfection of actual games and the highly imperfect gamespace of everyday life in the rat race of free-market society. The book depicts a world becoming an inescapable series of less and less perfect games. This world gives rise to a new persona. In place of the subject or citizen stands the gamer. McKenzie Wark is an Australian-born writer and scholar. He works mainly on media theory, critical theory and new media. McKenzie Wark relates analog input to qualitative, exploratory states of “play”, and digital input to quantitative, goal-oriented “gamespaces”. He discusses the various combinations in which the analog and digital manifest and the properties of each. The digital made me think of win states, and how their existence in a game affects the player’s experience and goals. When talking about the digital, Wark refers to “decisions” as a key component – something must be objectively or subjectively better, and thus desirable. When Brenda Laurel says that “Even the smallest fragments of your idle time have been colonized”, I feel that the word “idle” is no longer applicable, because it implies a sense of meandering that is not as prominent in goal-oriented games. I was thinking of ways to subvert win states in games ordinarily dependent on them. One way is to give a simple win state with obvious moral repercussions. The game must be easy and/or boring enough that the player must concentrate on what subjective effects their actions will have (these actions would have no effect on the gamespace itself). The game Spec Ops: The Line makes the player question the ethics of military FPS’s by combining generic CoD-inspired gameplay with morally repulsive actions. With many violent games, the joy of manipulating the abstracted system presented by the game overrides the player’s moral boundaries (some games use this idea as commentary on the player, like Hotline Miami). I think another interesting experiment would be to remove win states from existing games, thus encouraging subjective, personal goals that exist at the heart of play. In class, we covered a piece that removed the enemies from Super Mario. Analog is associated with spatial representations. Wark gives the example of a clock. The word topography itself implies distance, space, a journey rather than a destination. The existence of a win state, however, automatically directs the player towards the destination, thus discouraging them from both discovering (as the end-goal is already “defined”) and wandering. Wark says that when too many rules are imposed on a system, and the win state becomes too encompassing, that the game becomes completely goal-oriented and that play can only emerge from the system as a side-effect, not a core feature. According to Wark, the digital artificially reduces the breadth of analog play into quantitative structures. The digital is an imposition, an overlay onto an existing topographical structure. The digital creates an artificial, “timeless space that can be saved by making all of time equivalent”. The “residue” that analog systems leave can’t be made equivalent, however, because the core of such games is experiential, irreducible. Wark suggests that art can be the “residue” or “trace” of analog actions, which reminds me of action painting. Playing the game becomes a kind of performance. I thought there might be a similarity between “analog vs. digital” and “mechanics vs. rules”. Mechanics define what’s possible within the game, while rules define what’s allowed. The analog suggests the spectrum of experiences possible within a system, while the digital codifies and formalizes it into a limited system. Wark claims that “the analog is all about relations….the digital is all about boundaries”. Wow this seems too abstruse for me, i spent a whole afternoon on it but just finished half, because i have to look into the dictionary every few words…But anyway, even it is hard for me to understand everything mentioned in this article, i still found theories interesting for me. First, should games be digital only? I do not really think so. Like playground games, or board games, as long as it gives clear goals, restrict rules, everything makes a difference between win state and lose state, it is a game for me. So games should not just be limited to digital games. However, does games need win/ lose state as a main feature? I still do not really think so. Some experimental games, for instance, “Every day the same dream”, i played several times, but just found it to be different when you try things in different order, but no winning/losing screen comes out and say the result, but for me, it is still a game. Another example, “attack of the swarm”, it is just about using the swarm grabbing people and kill them, the higher score you can get the better, but no losing state there. It is still a game. Also, for none-liner interactive story telling game, that should count as digital, but with different choices you made, the result and story lines will be different. Not everything in it divided by just one line, it should be more complicated than that. For many interactive story telling game, there is a losing condition, but for some, there is just different endings based on the player’s choice. I do agree that the digital divided the things by absolute distinction,but all of the evidence player collected, choices have made, is about relations, instead of clearly boundaries. That’s it, maybe i will post more after i get better understanding of this article by reading it a hundred times. We’ll see. The one thing that made me think that McKenzie wrote was “The only reward is that the very time itself that the gamer commits to the task will make the task worthwhile.” I mean, the paper is good and all but I really don’t know half the stuff he is saying–I am also really tired so I might give it a read again in the future. Anyway, yeah, it’s always hard to explain why you play video games to people who don’t play video games. “Why do you spend all your time playing that game?” “…Because it’s…fun?” “DO YOUR HOMEWORK” Sometimes I spend a lot of time playing a game, and at some point I get bored of it. Okay, so where does all that hard work go? Especially for MMOs, where does that 3-5 hours a day go when you don’t want to play anymore? You can’t export your achievements, stats, items. Maybe you can sell your account to a middle schooler for $20. Sell back games to GameStop that you are never going to beat (or sometimes, did beat but no replay value). Why do we do it? Why give away time we will never get back doing something that is not real????? One, because it’s fun while we are having the fun. Maybe we can’t recall how much fun we had playing that game, but BOY was it fun (you don’t remember, and that’s why it seems like you wasted your time). Spend your money and spend your time for something that’s worthless from others’ perspective (maybe there are a couple people out there that understand). But it’s not worthless to you, at least you think so at the time, and also because you’re brainwashed. Games are fun. But things have also changed. We think these new games are fun because they say they are fun. Are they? Why are we still spending $60 just to keep ourselves busy? You don’t know what’s fun anymore. It probably doesn’t exist in our generation. Maybe it does, but not where it should be. We play games because it’s worth our time experiencing that specific experience from playing it. Some people like watching others play, and that’s enough for them too. Even though getting a high score or finishing the story doesn’t get us a job or a raise, it still makes us feel good. Wouldn’t it be great if we didn’t have to worry about money and we could just play video games all the time? Some of us already do that (and some get paid to as well). But here I am, everyday with too much work to do, but I still manage to make myself open my 3DS and try to collect more Bells (currency) in Animal Crossing, causing me to finish homework later, giving me less sleep, ruining my health and sanity. I see people in their rooms playing games all the time, as if they don’t have any homework to do. Some probably don’t have homework. That’s fine, it’s their life. But there are some that just need to keep playing, it’s just part of their daily routine. Wake up, play some Star Craft, eat breakfast, play Star Craft, go to class, go home, play Star Craft, do homework, play Star Craft, finish homework, play Star Craft, sleep. Weekends are a different story. Why does this system exist? Do we really believe that putting all of our time into a game is valid? I often feel guilty playing games when I know I have work to do. That means, for me, games are not a productive part of my life, but that doesn’t mean games aren’t beneficial. It’s different if I were a game creator, or if I had lots of money. I guess it really comes down to our past. Remember how we could play games with no consequence? We didn’t have any responsibilities, but we had games. Back then board games were cool too. Now I’m kind of scrambling up some minutes to play a game. Some people play games to waste time (like, on their phone). That’s weird, games that are supposed to be “time-wasters.” Why would someone want to waste their time? Oh, it’s a game, of course, that makes total sense. There are some games out there that are not wastes of time and that everyone should probably play (like those “10 books/movies everyone needs to watch,” games can be a category too), but not everyone appreciates games (not everyone appreciates books or movies). So are games supposed to be worthwhile? People take the time to make them. I think it depends on your mood. Sometimes you think you can play this game forever, then you never want to play it again. It’s pretty complicated, but the thing is games are fun so people play them. When games aren’t fun anymore, it means you aren’t playing the right games. While the reading was certainly engaging and thought-provoking, I felt that is was quite convoluted. I felt that McKenzie Mark could have conveyed similar messages and ideas without the need to make me feel like I have an inferior vocabulary or understanding of mythology. That said once you move past the confusing wording, Mark did have some interesting points. Such as that the player “pays” the price of time to the game to in return be given access to the gamespace. This is an interesting way to look at playing a game. That it is a transaction between the game and player. The player’s currency is time and the game’s currency is enjoyment/fun. These three quotes allude to what Adam Nelson was saying in class. Play in Mark’s mind is made of players and game mechanics. Whereas games are made of players, game mechanics and rules. Rules are in this sense digital. Rules are boolean values. [Did you step out of bounds? Did you reach the end score? etc.] This is an interesting way to look at things for sure. That the addition of rules by the game essential directs play in the same way a film director directs a scene. The game encourages and animates play through what its rules direct. Another interesting point. No matter how long we spend playing a game, it doesn’t change. If you erase your save file and the game is still there to be played again in almost exactly the same way. As we progress through a game we push the rock up the hill. Once we are done with the game if we want to restart, we let the rock roll back down the hill for us to push up again. While not immediately apparent, this line brings up intriguing realities. Games are governed by digital. The digital parts of games control the analog parts of games. Art is analog, and is one of the analog pieces in a game. The game designer is the controller of the digital and analog; the imposer of the rules. Thus the game designer is also the controller of the artist; a creator of the analog. However I did find his comparison of the story to Sisyphus interesting. 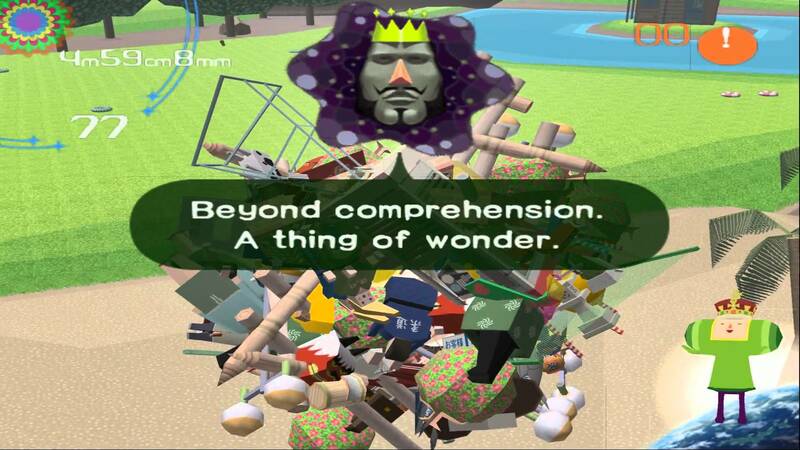 I had a familiarity to Katamari before, but I hadn’t considered that really, all you are doing is rebuilding the universe so that the King of the Cosmos might just break it again. Thus creating a cycle and making all of your work for not; you roll your ball, you make a star, and you repeat. This also translates to the person playing the game, as in that no one really accomplishes anything by playing games besides entertaining themselves for a short while. All in all the article had some interesting key points, but the majority was Wark rambling about his miscellaneous discoveries about the relation between analog and digital. This article made me think about something that I have thought about before in a new context. Wark’s talk about the digital versus the analog made me think especially of time. Time seems to be continuous and ever changing. But, on a very small scale, is time made up of some basic unit? Is time one fraction of an instant after another, or is it really “continuous”? If time was slowed down an infinite amount, would it still be moving continuously? This distinction seems incredibly hard to make. In the context of animation and games, time is broken down into frames. So even if we view time as analog, there is an automatic digital limitation put on it. Wark seemed to think that digital is binary, something is either off or on, while analog is infinite and ever-changing. Digital is on one side of a line or threshold, while analog follows a moving line. He seemed to be of the opinion that there are different ways to view and interpret one thing: it might seem analog, but in a different way it can be digital. Or something digital might actually be analog in a different sense. I think the tough distinction between the two is what makes trying to distinguish them rather interesting, and I think Wark did a good job of bringing up different instances of these distinctions and raising discussion about them.